When Thomas Ardern inherited Peddimore in Sutton Coldfield he went hunting in the surrounding countryside, oblivious of the fact that the Earl of Warwick had the sole rights to hunt in the Chase of Sutton Coldfield. Ardern was arrested in 1287 and taken before the Earl’s court. A fine was paid, and an agreement made, recorded in a deed issued by the Earl specifying what conditions Arderne must comply with. 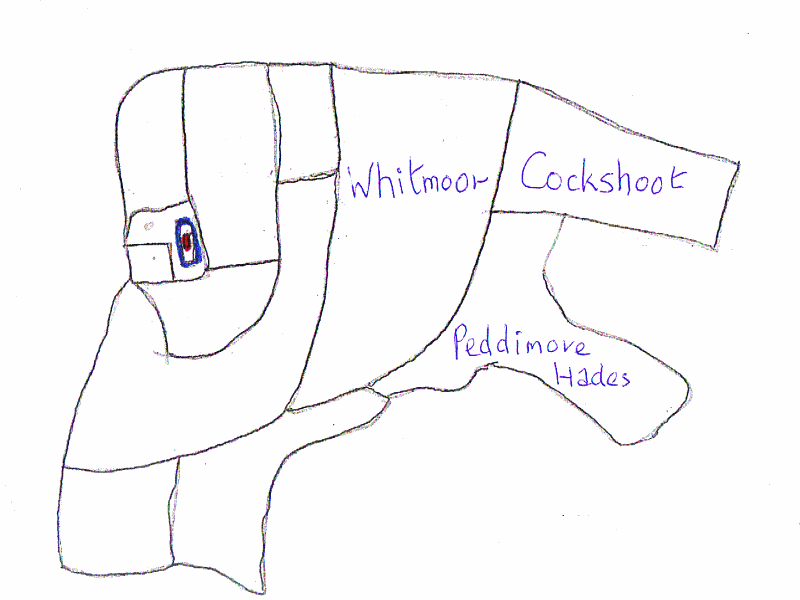 Peddimore had probably been established as a hunting lodge in Sutton Chase earlier in the century, perhaps as early as 1200 - a document of 1583 refers to it as “The Lodge of the Waste of Arden Hill in Minworth”, the word waste meaning a tract of uncultivated or wild country. At first not much land would have been attached to the lodge, and that mostly pasture for the huntsmen’s horses. However, population generally had increased by 1287, and the Ardens converted the lodge into a Hall with a home farm. This entailed bringing some of the wild countryside to the south and east of Peddmore into cultivation, and this could only be done with the permission of the Earl of Warwick, owner of Sutton Chase. The process of taking in land from a forest or chase was called assarting, and Arden’s 1287 agreement with the earl specifies that he may “assart up to 20 acres and enclose them so that does with their fawns might leap over the hedges, and grow corn so long as the cattle of anyone having rights of common could graze the land after harvest” and retain an assart which had already been made. Traditionally corn was grown in large open fields by peasants who held long strips of land such that a very long furrow about 220 yards long would be ploughed before it was necessary to turn the cumbersome implement round. The newly assarted fields at Peddimore needed to be very large in order to accommodate such long ploughlands, and the sketch plan shows three such large fields, probably the result of thirteenth century assarting, still in existence as part of Peddimore farm in 1634. The Ardens neglected Peddimore, and by 1656 only a few foundations of the building inside the moat remained. By 1700 the hall had been rebuilt, the property was in the possession of the Addyses of Moor Hall, and the farmland had been reorganised. Some of the land to the east was sold, and an equivalent amount to the west purchased, the total area remaining roughly the same at 170 acres.. All the fields were subdivided to between three and eight acres, reflecting the revolution in agriculture which favoured convertible husbandry (fields alternating between arable and pasture) and the use of the more manoeuvrable horse-drawn plough One former arable field became permanent pasture, where the ridge-and-furrow pattern left by medieval ploughing can still be seen. Modern farming has favoured the removal of hedges to create vast fields where modern machinery can operate, so the old field boundaries at Peddimore have almost all gone, only detectable by archaeological survey, and even this green belt land will soon be buried beneath new housing and industrial developments. 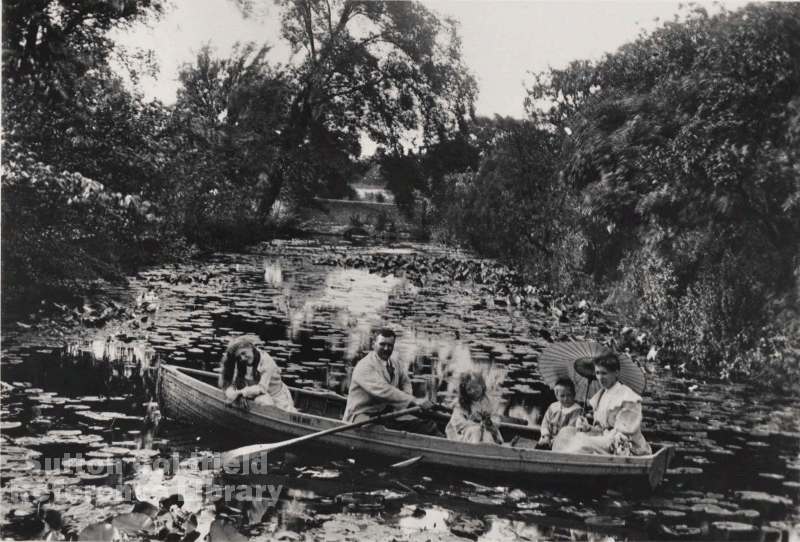 The huge moat at Peddimore Hall, photographed in 1892 with the King family out for a row. (photo courtesy of Sutton Reference Library). Plan of Peddimore Farm in 1637, based on a deed of 1634 and later maps; the three named fields were probably assarted in the thirteenth century, while the three fields immediately surrounding the moated hall may be all the land that was attached to the lodge when first built. Peddimore Hades measured 22 acres, Whitmoor 31 acres, Cockshoot 16 acres.